Ranches under quarantine in southeastern Alberta could be collectively losing $15,000 to $30,000 per day feeding and caring for the roughly 10,000 cattle they can neither move nor sell. And much of that money may never be recovered, which is prompting calls for a new approach to compensating producers whose herds are being investigated for bovine tuberculosis. “These are cow-calf producers, and they’re not able to move their calves at exactly the time of year that you would be moving them to sell them,” said Rich Smith, executive director of Alberta Beef Producers. “Now they’re having to hold and feed their calves, and they don’t have facilities or feed for wintering their calves. And because they haven’t made any sales, they don’t have any money to purchase feed. In late September, the USDA confirmed a case of bovine tuberculosis in one cow from a farm near Jenner, and since then, around 33 farms in Alberta and two in southern Saskatchewan have been quarantined. The positive case of the disease will not change Canada’s tuberculosis-free status and should not affect trade, said Smith. “The tuberculosis case does not have huge significance for the industry as a whole, but it’s devastating for those producers who are affected by it,” he said. Producers receive fair market value for any animals that test positive for the disease and are destroyed, but “there’s no federal compensation in place to pay for those animals in terms of yardage and feed,” said veterinarian Dr. Cody Creelman. “There are some resources available within each province — like AgriStability — that can potentially help offset some of those costs, but it’s very difficult,” said Creelman of Veterinary Agri-Health Services in Airdrie. And as the quarantine stretches on, the costs will continue to climb, he added. 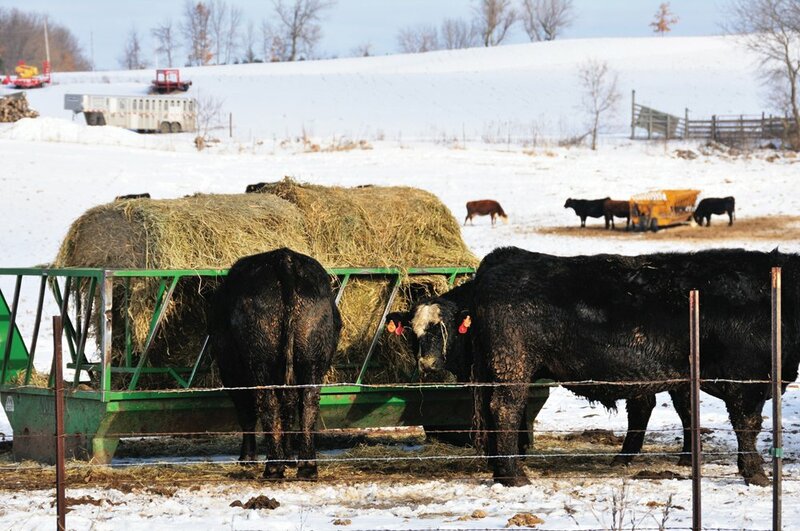 Costs will vary depending on the price of feed and the type of winter feeding system used, but at a minimum, producers can expect to pay around $1 to $2 per head per day to feed cattle over the winter — not counting yardage costs. “You could expect on a per-animal basis to be running between 50 cents and $1 per animal per day to keep those animals in terms of yardage,” said Creelman. And for those producers who don’t have the facilities or cash flow to feed their cattle over the winter, this quarantine is quickly becoming a crisis. “The majority of the producers on the cow-calf side is going to be lucky to break even with every factor working in their favour,” said Creelman. “For producers, cash flow is strapped already right now because calf markets are down, but these guys have lost the ability to sell into the higher markets earlier on. “We don’t know what the final timelines will be, but I don’t see the timelines shortening up,” said Creelman. The “sheer size” of the herds being tested is slowing down the process, he added. “We’re talking about very progressive producers who are running very large operations, so the logistics of being able to move those animals and implement protocols — well, I don’t think this scale was ever imagined from a regulatory standpoint,” said Creelman. “But now we’re talking about very large herds, and I don’t think anyone thought of this scenario,” he said. Initially, the CFIA sent only two teams to test the animals, but it has since added three more. But it’s unlikely that many more farms will be quarantined in the weeks ahead, said Smith. But the CFIA has committed to improving the “information flow” to affected producers, said Smith. “Producers are concerned and they have a lot of questions about how the investigation is proceeding,” he said. “They made a commitment to us that they’re going to do a better job of communicating with the producers who are affected by the investigation. One of the unknowns is the origin of this particular case of bovine tuberculosis. But the industry needs to be careful about drawing conclusions from that, said Dr. Eugene Janzen, a professor at the University of Calgary faculty of veterinary medicine. “Other countries in the world have reported different strains than we’re familiar with,” he said. “The science of examining those organisms — the molecular tests that we’re able to do — have probably pointed out differences that we might not have been aware of in the past. The prime suspects are the 7,000 or so wild elk that roam on the Suffield military base directly south of where the infected cow came from, said Janzen. “There’s lots of precedent for wildlife acting as a reservoir or contributing to the persistence of the problem within the cattle herd,” said Janzen. “But we have to be careful not to incriminate wildlife simply because, at this stage, we don’t know. Right now, the CFIA is focused on testing cattle — not elk — and aside from some “advanced passive surveillance during this hunting season,” that’s unlikely to change, said Smith.